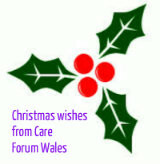 Care Forum Wales wishes all its members, colleagues and partners a merry Christmas and a Happy New Year in 2016. We look forward to working with you all again in 2016 - which promises to be a landmark year with the Social care and Well-being (Wales) Act which comes into force in April. When it's implemented there may be changes on the ground that you need to be aware of and we'll keep you posted about these. See the Care Council's Learning Hub for learning resources and up to date information here. We are still awaiting the results of the Judicial Review hearings on Funded Nursing Care which were held in November. Watch this space for updates. And of course 2016 will soon bring the time for nominations for the next Wales Care Awards and preparations for Care Home Open Day. In the meantime have a very happy Christmas and see you in 2016!